Be a part of our Cal Poly Pomona family! 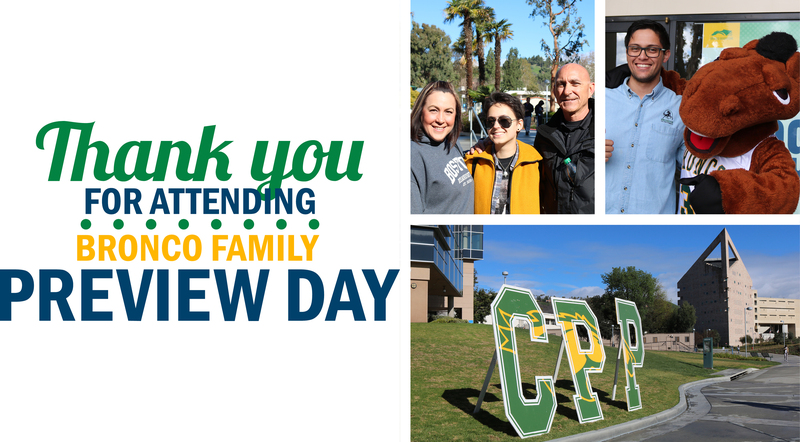 Thank you for joining us at Cal Poly Pomona for Bronco Family Preview Day. If you were unable to join us, but would like to schedule a campus tour our meet with an Outreach Counselor, please visit the Outreach, Recruitment, & Educational Partnerships website. If you have immediate questions, please email us at previewday@cpp.edu or reach us at (909) 869-3529. Thank you to those who responded to the Preview Day survey. 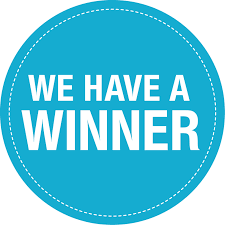 The 3 lucky winners of a CPP sweater are Katie Cruz, Lucas Mandujano, and Adrian Zurita. The 5 lucky winnerws of a t-shirt/hat bundle are Kelly Chu, Phoebe Granado, LaTasha Lyons, Andres Ruiz, and Anjali Vaid. Congratulations to all of you! Please check your email for next steps to claim your price by March 8, 2019. What's Next for First Time Freshman and Tranfer Students? View the presentation What's Next for Transfer Students and What's Next for First Time Freshman. These sessions covered the steps incoming students must take in order to enroll for fall 2019. Cal Poly Pomona is easily accessible by major freeways and airports. For more information, visit Visitor Information. 1. Is there a cost to attend Bronco Family Preview Day? The Bronco Family Preview Day is free to fall 2019 prospective students. This includes workshops, complementary parking permit, campus tour, housing tour, and resource fair participation. Family members are welcome and may be included in the online registration form. 2. Does attendance to Bronco Family Preview Day guarantee admission to Cal Poly Pomona? No. Bronco Family Preview Day is an opportunity for you and your guests to explore Cal Poly Pomona. Bronco Family Preview Day is not mandatory. 3. Can I attend Bronco Family Preview Day if I don't know my Admission status? Yes. If you applied for Fall 2019, this is a great opportunity for you and your guests to explore Cal Poly Pomona. 4. When does registration close? Online registration will be accepted until capacity is reached. 5. Will workshops or campus tours be offered in another language? Yes, select workshops will be translated to Spanish and select tours lead in Spanish. Please note, translation and campus tour spaces will be available on first come first serve basis.